I am so glad that you are joining us this week for our Artisan Wednesday WOW blog hop. Just in case you are joining us for the first time, let me explain. Each week the ten members of the Stampin' Up! 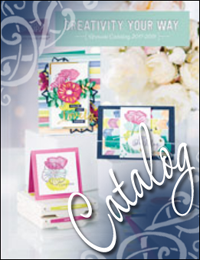 Artisan Design Team post projects that are created primarily from a box of goodies we receive monthly from Stampin' Up! Our blog hop makes a complete circle. At the end of every post there is a "next" button that will take you to the next blog until you end up back where you started. If you are hopping, then you should have arrived here from Cindy Schuster's blog. I am totally loving the March box. It has been difficult to narrow down what to do because there were so many wonderful things to choose from. I actually have two different types of projects for you this time, so be sure to read all the way through. A few months ago I was helping one of my downline design some cards for her stamp-a-stack class. We were short on time and I had just injured my shoulder from falling on the ice. So I came up with this card because it is what I would call "low prep". We were able to hand the participants some card stock and they did most of the work themselves. This is a stepped-up version, but it is basically the same. Just stamp the Hardwood background stamp with Crumb Cake ink on a Crumb Cake card base. The sentiment uses the Chalk Talk stamp set and the flowers are from the Flower Shop set. The basic color combo was Pumpkin Pie, Melon Mambo, Daffodil Delight, and Old Olive. You don't need to be a paper crafter to enjoy this next project. I don't know how to knit and I am fairly limited on my crocheting abilities, but I found this cute pre-made cap at the craft store. Even better than that...it was on sale. Woo Hoo! I knew immediately what I wanted to do...add felt flowers. I used the new Spiral Flower die and cut two different colors of felt (yellow & gold) and then loosely rolled them to create the flower. I used the Circle #2 die to cut the leaves. The care directions on the cap said "spot clean only" so I decided to stitch everything directly to the cap. That way you don't need to worry about scratching or irritating their precious little head. I just totally love how it turned out and it was super fast and easy. I am at the phase in my life when it seems like I know several couples who are expecting. I am convinced that you can never have too many baby gifts on hand. One of the reasons I love the Perfectly Preserved and Friendship Preserves stamp sets is that I do a decent amount of jam making each summer. Every Christmas my neighbors have come to expect their Blackberry Jam with some different and clever packaging. This year I have a little surprise for them...not only did I make yummy blackberry jam, I also made a big batch of pear preserves. This is what some of them will receive this year. This is one of the projects that I made with the gals at my last class. I did some simple sewing to make the burlap bags. I measured the circumference of the jar and added two inches. This gave me a 1/2" seam allowance and a little wiggle room for the jar. I also added about five inches to the height of the jar so that I would have just enough room to stitch the bottom piece closed and have some leftover at the top to tie shut. We stamped and paper-pieced the jam jars to create a fun tag. They really had fun making these and now they have one of their Christmas gifts all ready to go. I have been doing a lot of traveling lately and have needed a way to store my curling iron when I am on the go. So today I got inspired to make a curling iron cover. I needed something that would be heat resistent. That's when it hit me. Why not use an oven mitt? I had a brand new mitt just begging to be put to the test. I cut off the thumb portion, turned it inside-out and stitched up the side. Then I just turned it and volia...a super easy and pretty cover for my In-Styler. If you don't have a sewing machine or know how to sew, just use the oven mitt as is...it couldn't be easier that that! I know this isn't exactly a stamping/paper crafting project, but I just had to share!